The current forecourt road of Fleet train station is for taxis and buses only but clearly there isn’t enough parking for bicycles. 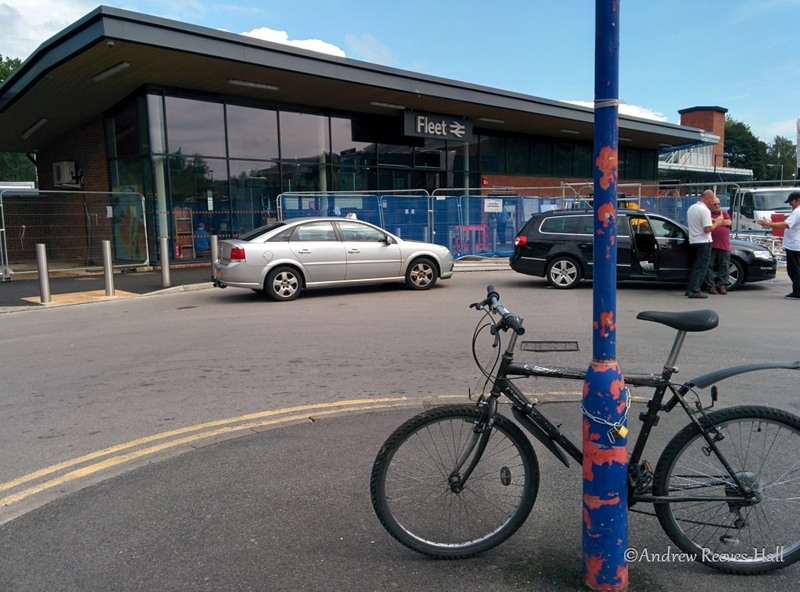 Last week, the managing director of South West Trains told me that the plans for the forecourt of the Fleet, Hampshire train station were not yet finalised – see Reckless Cycling at Fleet Station. So, earlier this week I asked a construction site manager at the station what the current state of affairs was. He kindly referred me to the appropriate engineer in charge at head office; who has just responded to my queries with a plan of the forecourt dated simply “July 2014” and marked “preliminary”. In other words the plan is not yet approved and most likely will change, although it seemed quite well advanced, especially given that there is work going on in the forecourt now. 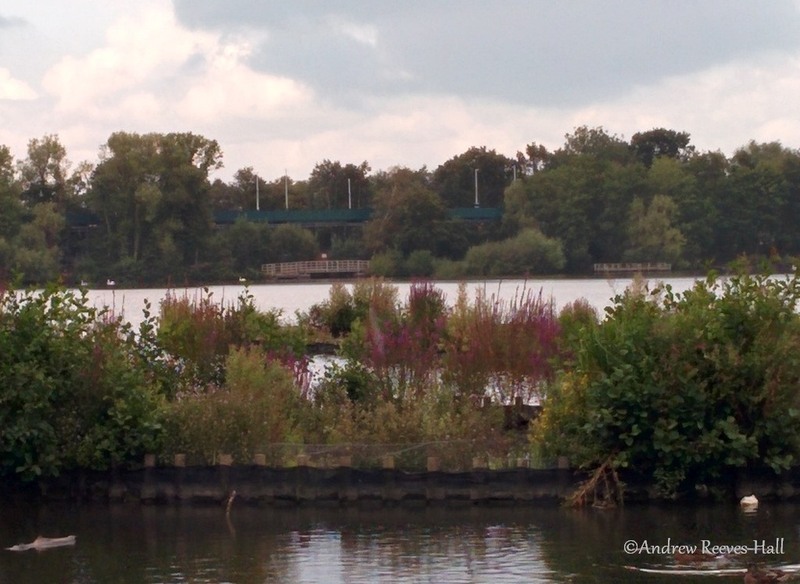 The Great Wall of Fleet – aka the car parking deck – and its lighting is visible from Fleet Pond. The draft plan for the forecourt has a heavy focus on motor vehicles: 74 new parking spaces for cars or taxis – including 30 “Premier” parking spaces – and an unstated number dedicated to motorcycles under the new car deck’s ramp. This is on top of the several hundred new spaces in the newly opened car deck. The draft plan shows nothing added to what had already existed for bicycle use and parking, which is disappointing given that South West Trains received the “2013 Cycle-Rail Operator of the Year” award. The secure bicycle storage area does seem to make a reappearance further down platform 2 in the draft plan (the original area was demolished at the start of the work on the new station building); and a few benches replace what was once planned as motorcycle parking beside the bus stop. It appears to me that Hart Council is, on the one hand, happy to support hundreds of new parking spaces for motor vehicles in a car deck beside Fleet Pond, an area of Special Scientific Interest (SSSI), yet only “requests” that existing bicycle parking (2012 levels) not be decreased. The Hart Council has a Local Strategic Partnership for 2008-2018 which states that local people and local businesses have stated their priority is for “an environmentally conscious community and a sustainable district” with a “sustainable and accessible transport system”. Furthermore, the Hart council’s Traffic Management Procedure states that it assesses schemes against the key objectives of: improving road safety, reducing congestion, improving accessibility and improving air quality. The preliminary plan from July 2014 for the Fleet, Hampshire train station’s forecourt (click to see larger image in PDF format). I asked Hart Council and Councillor Sharyn Wheeler what has been done to follow-up on the council’s original request about cycle parking; and whether the council has considered the forecourt plan with regard to the hundreds of people who arrive and leave the station by bicycle. 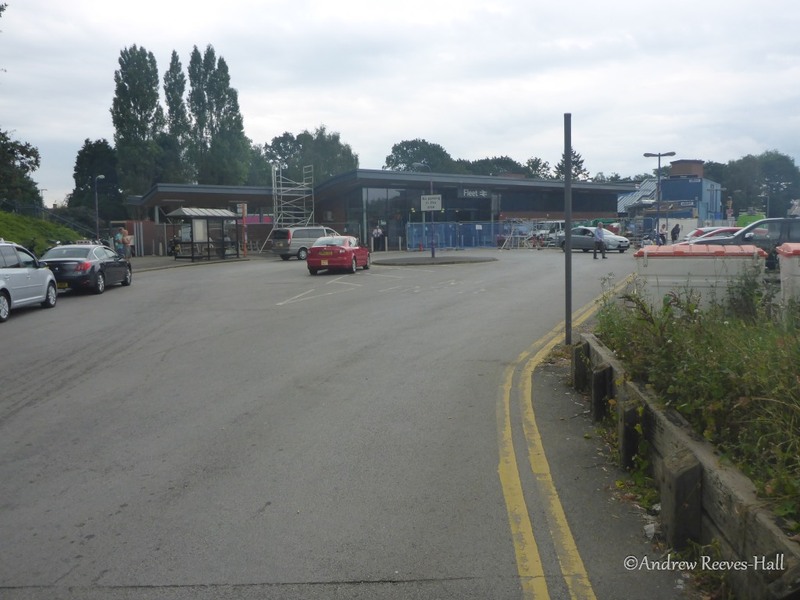 I understand that the works at Fleet Station are not yet complete and that a number of issues, including cycle parking are yet to be provided. This is not a Council project. South West Trains/Network Rail are doing it under their own powers. They don’t need our input or approval. Network Rail claimed that their works fall under Class A of Part 11, Schedule 2 of the General Permitted Development Order but because their proposed works included “the erection, construction, alteration of any building, bridge, etc” that it was required to get approval from the council. I note, too that approval is also required if there is “formation, layout out or alteration of a means of access to any highway used by vehicular traffic”, which there is in this case. The present forecourt has a single entrance and exit for taxis and buses. The draft plan shows this being narrowed and made one way, with an exit coming out to the main route to the new car deck. If South West Trains wants to fulfill Hart council’s Local Strategic Partnership plan’s priority and the criteria of “Reducing Congestion” then the travel scheme must be designed for “encouraging walking [and] cycling”. The draft plan for the forecourt does very little to support that, and indeed may put people who cycle in danger’s way by making them cycle around moving buses, taxis and people pulling into or out of car parking spaces. In short, there is no proper, segregated space for cycling in this draft plan. So there is hope yet! The issue with bicycles and the Fleet train station redevelopment made the front page of the Fleet newspaper on 28 August 2014. Click to read story online. The front page of the Fleet News & Mail newspaper carried the story of the lack of space for cycling and bicycle parking in South West Train’s forecourt plans. I have queried Hart District Council what follow-up it has done regarding the spending of its money. building in physical activity into their daily travel routines. Invest in sustainable transport measures, including walking and cycling infrastructure, principally in urban areas, to provide a healthy alternative to the car for local short journeys to work, local services or schools; and work with health authorities to ensure that transport policy supports local ambitions for health and well-being. Aside: the document confirms that a secure cycle parking compound was installed in 2011 with funding from the DfT. Use was free but required a £25 refundable deposit for the swipecard that let you into the area.